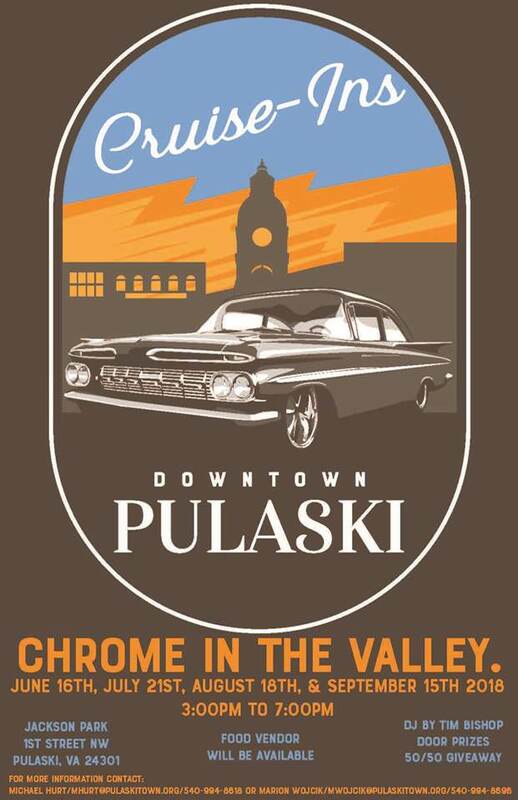 The Town of Pulaski presents the August Chrome In The Valley Cruise In on Saturday, August 18, 2018 at Jackson Park in Pulaski, VA.
What a better way to spend a summer evening! Have a car you'd like to showcase? Just want to take a look at cool cars? Visit Jackson Park this summer for fun with your friends and family. We'll provide the entertainment! DJ music by Tim Bishop. There will also be door prizes and a 50/50 giveaway. Food vendor will be available. To view the event flyer, visit: https://i.imgur.com/xbV8Nij.jpg. For more information, visit: https://www.facebook.com/events/211638146243751 or contact Michael Hurt at mhurt@pulaskitown.org or call 540-994-8618 or contact Marion Wojcik at mwojcik@pulaskitown.org or call 540-994-8600.